Michigan DE worthy at No. 5? Regular readers of Joe know he’s hot for a defensive end at the No. 5 pick, as Joe is for a rendezvous with Rachel Watson. Joe gets so depressed surfing the net thinking Kentucky manbeast Josh Allen will get selected before the Bucs are on the clock. Damn, there needs to be teams trading up for quarterbacks. 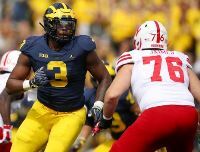 Former Eagles, Browns and Ravens scout Daniel Jeremiah of NFL.com is high on Michigan defensive end Rashan Gary. Most draft experts are high on Gary, too. But Joe also remembers how folks waxed the backside of Jabril Peppers, also a Michigan product, and he went late in the first round in 2017. Same with Taco Charlton. Then Joe noticed how Michigan, which was supposed to have a decent defense last year, bent over and gave up 103 points in its last two games, against Ohio State and Florida. Could a defense boasting a defensive end like Gary be that terrible? Gary is 6-5, 287. Draftniks believe he can play tackle or end but isn’t 287 a bit heavy for a defensive end? Joe will have to do more homework on this Gary. Just based on recent history, Gary could be a hair overrated. I think that he’s overrated too, Joe and I’m a Michigan fan. He’s my fav @ 5…however since were are fantasizing (Rachael Watson)…I started thinking yesterday trading back twice only a spot or few to QB greedy teams and having a top 12 +- pick and 2 extra second round picks…leaving the Bucs with 3 top of the 2ns round picks…..now that is restocking the roster ! I still can’t stop wondering if coach Bowles can use Noah Spence’s talents better than any of the previous regimes. If we had that answer it may not be as imperative to spend the first pick on a DE. exactly…..gary is a big tweener…..a little small for DT….a little too big for a DE…..he has talent but i think we need a player that does 1 thing great instead of a few things good…..thats why im a little hesitant on josh allen as well….i think ed oliver should be the pick whether its at #5 or at #10 in a trade down…..the last thing i want to see is us release GMC and not find his replacement until next year…..
i wouldnt cry a river if we picked gary or somehow allen falls to us but i think we need a DT upgrade….someone quick, fast, explosive and can put pressure on the QB…..let VV stuff the run and clog up the middle…. I am also a Michigan fan and I have always thought he was a bit overrated. His character is OUTSTANDING and he is a very good person(reminds me of McCoy) but I don’t know about drafting him at 5. To me a DE taken at 5 needs to be a QB sack/hit artist and that does not seem to be Gary. Very strong run stopper and iffy when rushing the QB. Granted some are arguing the scheme didn’t allow him to get after the quarterback as much as others but I still have my doubts. *Side note as well* – I do not believe Gary played in the Florida game. A couple of the starters sat out. i think bowles will get something out of spence….at least to the point of his rookie year when he had 5.5 sacks…..he’ll let spence do what he does best which is get after the QB whether its standing up or with his hand in the dirt….i think the former…. Joe is probably also against taking Clelin Ferrell who had 20 sacks the last two years just because he played DE for Clemson. He has been of NO interest to me. Like watching them rate Manti Teo high from Notre Dame, just because of the school. He got torched by Alabama in 2013 in the National Championship game, and fell to #38 overall. After 8 National awards he doesn’t start for New Orleans and has 1.5 sacks in 6 years. People jump on the hype train, then give their evaluation. Just once, I would like for all so called talent experts to all release their mock drafts at the same time and see where people fall. I hope BA and staff don’t read a single mock draft. Guy is a stud and would flat out be a player in bowles hybrid system. Not his fault his DC up there was schooled by Urban and ryan day in the OSU game because the michigan pass defense was exposed. How do you explain Florida rushing for 250 yards against them? Looks like the DC was schooled by everybody. Not arguing at all, I just think Michigan’s defense was rated high because of Harbaugh, not talent. If you’re looking at the Dline the most interesting prospect to me is Jeffery Simmons. If you can look past the history he is a top10 pick. Interesting to see if teams will believe in him or skip him. Assuming Nassib is still here, we don’t even need to draft a defensive end! gary didnt play vs UF this year….he didnt want to see ivey or taylor….he didnt want them problems….lol…. Gary’s production wasn’t great, and he doesn’t have many pass rush moves. Some say he played soft to avoid injury (he skipped the bowl game, so the points Florida put up wasn’t on him). Jason Licht said we’re going to draft guys that love playing football and the game of football, so maybe the guys who skipped their bowl games are at a disadvantage with Licht and our front office? Also, the media has talked about Ed Oliver missing games that he probably could’ve played in (I get it, he’s protecting his investment), running around on the field catching passes (DT catching passes?) before the game, then sitting the game out. I’d be shocked if we took Ed Oliver. The whole jacket deal with the coach at Houston is said to have been more about Major Appelwhite’s frustration of Ed Oliver not playing. i hope we can get zach allen in R2…..
corbin kaufusi is an interesting prospect as well…..i watched him a few times this year and he was dominate…..injury cut his season short but the kid had talent….and he’s a 6’9 DE…..LOL….BYU lined him up all over….stand up end….hand in the dirt….OLB….very athletic for his size…. In watching tape Oliver & Williams jump off the most in terms of just athletic disruption. Oliver seems to have the best burst off the snap of any DL in the draft. i agree regarding oliver and williams….wouldnt mind either one…. imo, oliver would pair nicely with VV…. Maybe a Top 20-25 pick, but hello no at #5 or anywhere near that. My real problem is the kid has already created his own “sports agency” in an attempt to represent players of all major sports, and the kid isn’t even in the NFL yet??!!? THAT screams prima-donna to me BIGTIME. Why?? Cuz it’s punk behavior, and completely tells anyone that just dedicating himself to his craft 1000% humbly and fervently for many years once playing in the NFL, isn’t his #1 priority. Dude hasn’t even produced 10 sacks a year in the NFL yet, hasn’t even been drafted #1 overall yet, hasn’t done SQUAT….and the fool, thinks he should have his own “sports agency”???! Sure. Cause JJ Watt doesn’t (yet or ever), Aaron Donald doesn’t….Tom Brady doesn’t…. But Rashan Gary thinks…he should. Egotistical as hell, punk behavior, he ain’t no Jay Z. And if you draft him, don’t say I didn’t tell you so, when his focus isn’t 1000% on being the next Strahan or LT.
Incidentally, that’s a good picture of Ms. Watson, but wayyy to tan….gross. i disagree on the prima-donna thing…lol…. imo, it shows he’s mature and instead on worrying about him partying all night and getting into trouble he would most likely be spendinghis down time either working out or working on his business…..
smart move by the kid imo….seems to have his ducks in a row and thinking about his future after football…..we all know it can end in a hurry….one snap…one play and it could be over…..
i went to BCC(now BCU) in daytona beach with nick collins….one of the most talented athletes ive ever played with or been around….he was a star for green bay….his career unfortunately was short lived due to a neck injury…..he doing well but mentioned how he wished he wouldve planned for life after football sooner…a lot sooner…..
regarding gary, i just dont think he’s top 10 talent….1st rounder for sure but not top 10 imo…..
Last year’s draft had more “generational” or “can’t miss” prospects. There are a few at the top of this draft but not like last year when it went all the way down to the sixth spot with Quenton Nelson. @Altered Ego This is why I agree with your assessment. Trade down. There are a lot of offensive tackles who would probably improve our offense. Pick up enough draft picks and you could probably draft two talented tackles and begin to rebuild our OL. Hopefully one of the two would be ready quickly enough to replace the hole created by DS’s release. There are also a lot of DL’s who would probably be available who may not be “generational” but still work out to be impact players. This will get more exciting after the combine. Somebody’s is going to turn in a great time…somebody will reveal terrific athleticism in the cones and time trial and jump really high. Hopefully the QB’s excel big time and create a run for a couple of the top 3-5 spots. Joe what if Allen on the clock at #4? I’m giving up my third for him. That’s cool, you can disagree. But it duzn’t make you… right. Once…ONCE…there is a brand built (that would be the player’s brand, based on the repeated, successful, extraordinary performance that a player’s performance on the field has built, THEN …there is something for the proposed clientele to be drawn to, for his company to represent them. AFTER he has built his acclaim. THERE is NONE. I’m NOT saying the kid can’t (ever) start the business….I’m saying HELL NO to now. Go build your brand, based on your play, beyond all doubt….then you start the business, and all the heavy lifting has been done for you. You people….out here. So often disagree with me, not on the merits of what I’m actually articulating…but because I came up with it, thought it through, put it forward in a forthright manner. And you all, don’t like the fact, that no one else did, or nailed it. Hence the nickname, on the posts. Just take it on its merits. your talking about him building a brand off his production but what if he never hits the field?….GOD forbid but what it he tears his knee up at the combine….or while visiting a team….or have a freak accident like beckwith(who’s career is in jeopardy)….great idea to have a legit back up plan that can net you big bucks in something that your familiar with…. and if you havent noticed, most draft prospects or athletes in general try to “build their brand” outside of the sport they play while their still playing….some open up clubs, some rap, some have tv shows etc…..
him having his own agency wont hurt ROC nation or any of the other heavy hitters….there’s enough athletes to last a lifetime…..his “brand” already has a foundation since he was a 5* recruit and #1 propect in the nation when coming out of HS…..he’s from the same place as will hill, jarbril peppers and many more….folks know him…..he’s focused on the youth…he already has 1 client currently besides himself…. i just think its wrong to say the kid should only focus on football because football can be gone in a second…..he’s finishing up his degree and putting it to use…..
football can be taken away from you in a heartbeat….best to build something that can last longer than your athletic career…. I dont know anything about Rashan Gary but it sounds to me like Stout has a personal vendetta against the kid. Who are you to judge what he does/ wants to do for a living? What does it matter to you?… Then you call him egotistical and punk? Wow. Somebody is pretty angry. Trade down & pick up an additional 2nd Round pick. We’ve gotta advantage of the fact that we’re switching to a 3-4 (and we don’t have all the pieces in pieces) and the Jets are switching to 4-3 (and they don’t have all the pieces in pieces). The Jets are sitting on upwards of 100M in cap space. Alot of these guys will look alot better next season, including Spence. There will be confusion and chaos at the line of scrimmage. 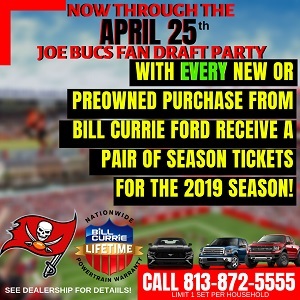 Are the Bucs really sending 7 or 8? The Oline wont know either. Gona be more gime sacks this year than the last 3 combined. Having said that tho this team still needs a DE. Considering its gona be mostly 3-4 we have alot more guys to choose from. I havnt seen Gary play alot but i hear he’s a bit overrated. If Bowles picks him tho than I’m a fan. Doubt it tho since he is more of a 4-3 DE and a bit more of a run stuffer at that. As a diehard Michigan fan this dude is anything but overrated he legit lined up every down on the extra blocker side(TE, OT in heavy packages etc.) so Chase could be the rush end in Don Browns defense. They also played the Lovie Smith offense last year where it was as vanilla as can be so lots of 3 and outs against the good teams sadly. Good stuff Luv, im just not high on simmons…..gimme Oliver if Williams or Allen isnt there….or trade down, maybe still get Oliver. I still want Devin White and Montez Sweat though. I think some trade downs and trades up could do it. Keep gmc one more year. Mlb and edge are both set for years with White and Sweat! Fireeee Licht if he picks this guy. I think the only way we grab an end is if the kid from Kentucky (Allen?) drops to 5 which I am thinking will not happen. It does seem crazy that we may have 2 ends (and possibly three if some people can be believed) in the first 4 picks. If Allen drops I say grab him then Quinnen Williams or Jonah Williams. One of the three should be there at 5. I am having a hard time wrapping my head around the possibility that San Francisco is going to take another top 5 defensive tackle. I am hoping that one the QB hungry teams jumps up to grab someone (probably Haskins)…the likely trade spot is us or Oakland.